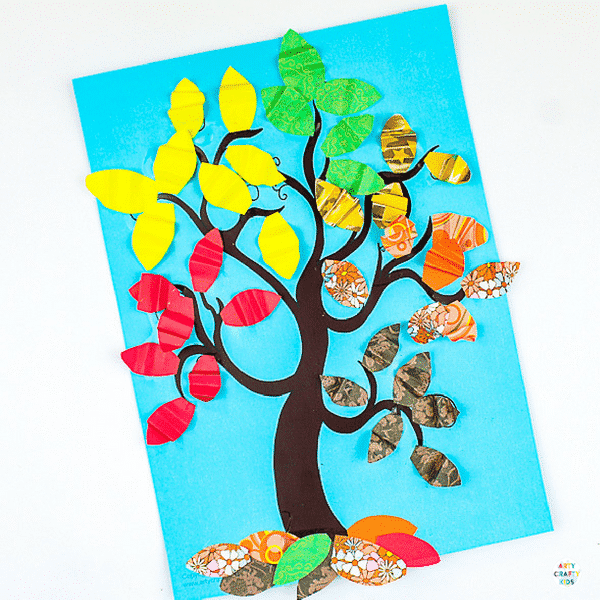 It’s that time of year again where we’re playing around with paper and glue to find new and unique ways to create gorgeous Autumn Tree art. I believe (and I hope you will agree), we have achieved exactly that with our new Accordion Leaf Autumn Tree! The accordion fold is a basic and fun technique for little hands to master, and gives fine motor skills a thorough workout! 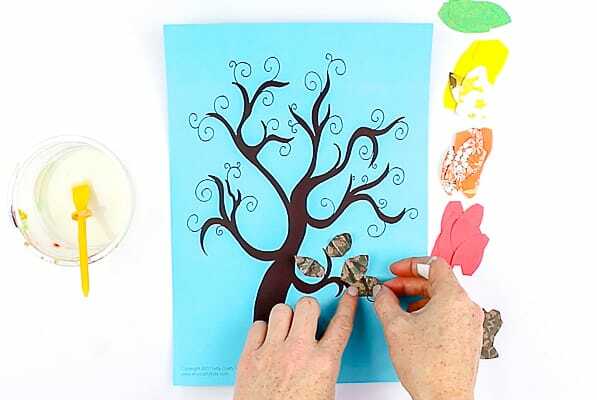 We’ve used this process within a number of our crafts (Paper Plate Lion, Newspaper Unicorn & Newspaper Witch) and here, it works particularly well; creating body and movement with a crunchy leaf texture. 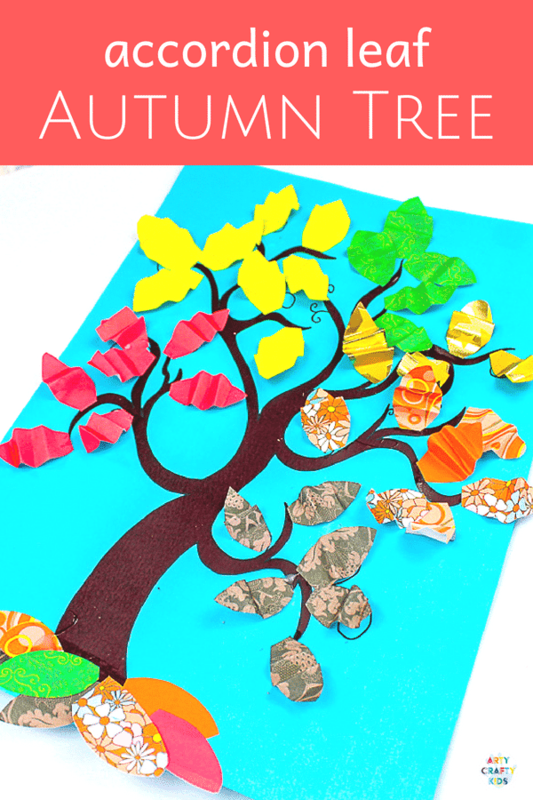 Paired with our handy tree template, this Autumn Tree Craft could work well within a classroom setting or/and with multiple kids. Enjoy this FREE tree template when you sign up for our Arty Crafty newsletter (the sign-up form can be found towards the end of this post) OR join our online Arty Crafty Members area to access our full library of Art & Craft Templates, How to Draw Guides, Colouring Pages, Animal Outlines, Drawing Prompts, Downloadable Arty Crafty Box Artspiration and instruction booklets and much more! Step 1. 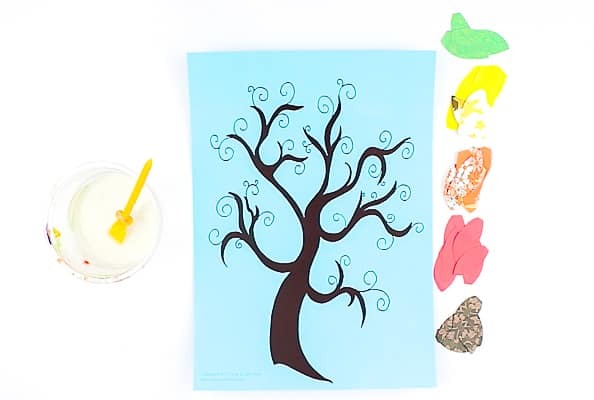 Download and print the tree template onto white or blue cardstock. 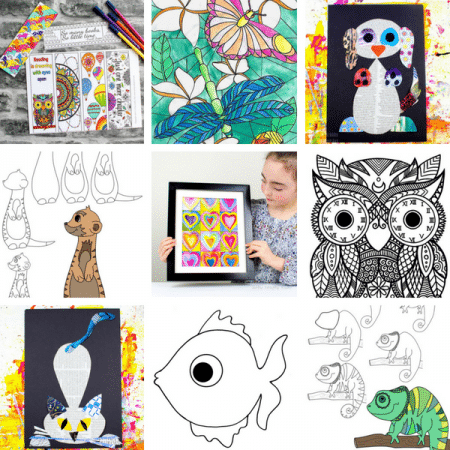 Alternatively, your Arty Crafty Kids can draw their own tree freehand or trace around their arm and hand to create an Autumn Handprint Tree. Step 2. 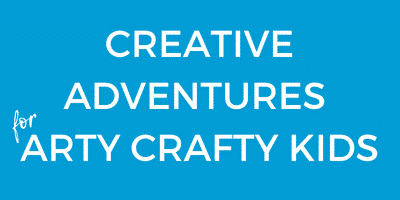 Gather an assortment of coloured, patterned and textured paper. Next, cut out a number of leaf shapes of each colour (or ovals for simplicity). 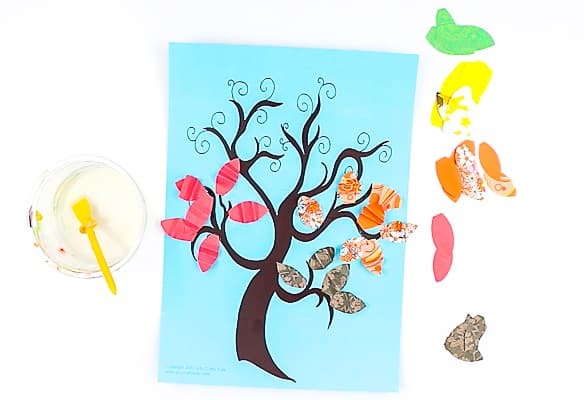 If your Arty Crafty Kids are using our Autumn Tree Template, ask them to count the number of twirls on branches and match this number with the correct amount of leaves. The accordion fold is a simple folding technique that creates a zigzag, pleated texture and is often used to make handheld fans. Rotate the Leaf so the fold is at the bottom and you have two flaps. Peel down the first flap until it meets the bottom fold. And repeat this step with the second flap. The accordion is now complete with even zigzag folds. Step 4. 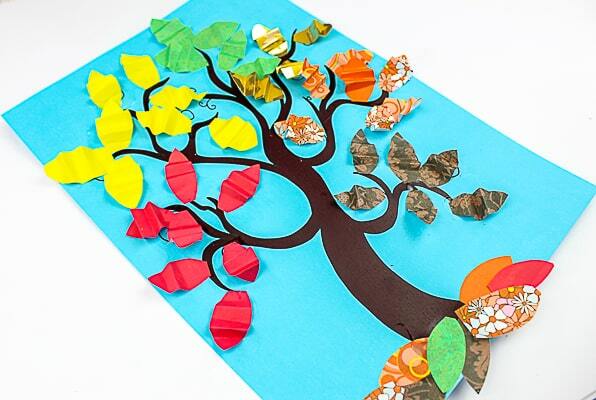 Fold all the leaves and begin sticking them to the Autumn Tree Template, using the twirls as a guide. As you can see, we have used the branches to segment and bunch colours, starting with the darkest shade at the bottom. Step 5. Continue working around the tree using a variety of colours and patterns. Be sure to only glue the ends of the leaves, as accordion folds will give the leaves bounce and movement on the paper. Step 6. 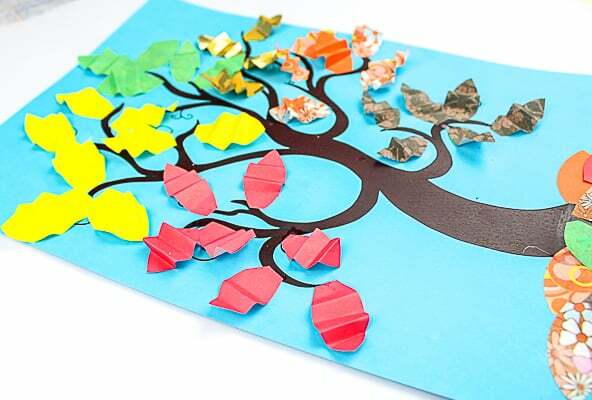 Once the tree is filled with bright and beautiful accordion leaves, add any remaining paper leaves to the bottom of the tree trunk. 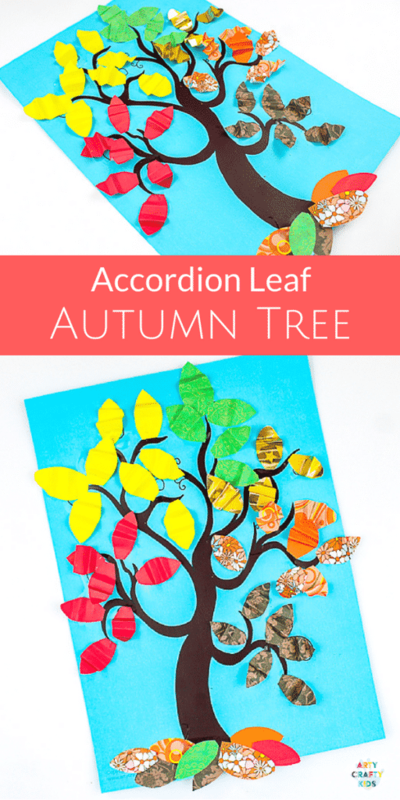 The Accordion Leaf Autumn Tree craft is now complete! 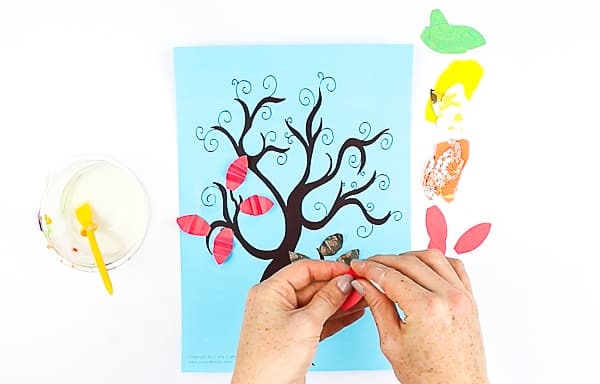 Autumn is the season of tree crafts and if you’re looking for alternatives way to utilise this handy template, take a look at our Autumn Bubble Wrap Tree and 4 Seasons Pebble Game!